This heat, sentiment and the brackets are all from the Craft's Meow...All you need is love set. And yes...I love it. A lot. The brackets are actually apart of another sentiment but I just carefully inked them up and added them here. I just love this sentiment. Too cute! Stay tuned this week, because I have some more coming with this set! Hope you are all having a great Tuesday! We are sick here. It's no fun! Little man has had some high temps and its time for another dose of Tylenol! Hope your day is a good one! Thanks for stopping! This is the cutest card ever, and the best sentiment. I can think of at least one special person I could send a card like this to. Cute :) I'm an abnormal females in that I'm not a chocoalte fan - gasp!! - but can fully relate as my daughter is a chocoholic and would love this card LOL! I just laughed out loud at your opening line - I sold 1 valentine's day card... that leaves a good half-dozen left at my house... hmmm... a valentine's week?? LOVELOVELOVE This Laurie! This is one of my fav TCM sets! You showcased it really well! Love that card! I need that sentiment...one more to add to my wish list. Love this sentiment--nothing better than chocolate. I too have been really in Valentine mode this year. I had a sale of "designer valentines" at my local Curves. But still have several left. Maybe I'll give one to my hubby to give to me! LOL!!! Such a pretty CAS card. 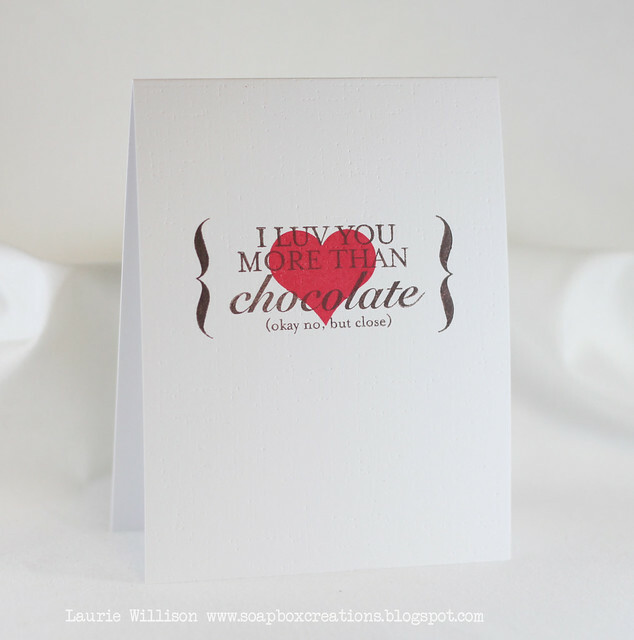 My DH and I both love chocolate so we could both use this card. Fantastic CAS card Laurie. I love, love, love the sentiment! How true! Love the senitment :) and adorable card, Laurie! You are such an enabler, Laurie lol! Now I want this stamp set too :) One more on my wish list. Oh how delicious! hehe This is a sweet card!!! Luv this sentiment - I WILL be buying it...HA! The brackets and tHe red heart behind the sentiment really add a lot to the card. Beautiful card, Laurie. That sentiment is too funny! Very cute! New goodies and a little giveaway..
Clear and Simple Sneak Peeks!